I've already mused in earlier posts about my rambling path through life and how things don't quite end up like you think they will, and also about the guilt I felt because the promise that my favorite teacher, Mrs. Capps (among others), felt I had never materialized. Or at least to my mind never materialized. But here's some more musing.. When I was little, my fantasy was never one of being rich or famous. I mentioned a few days ago that in the first grade I imagined I would remain buddies with my two best friends at that time, John and Henry, and we'd find wives, buy three houses in a row like Monopoly in a neighborhood resembling the one in which I grew up, and lean over the fence talking to each other during our breaks from mowing the lawn. As I got older I became interested in collecting insects. For a while I thought I would become an entomologist. So did my parents. I had my insect net, collections of the specimens I captured, and a voracious appetite to read more about these little creatures. Our next door neighbor, the Tanino's, had a lovely garden, complete with a small pond. During the summer I used to go there every day because all of the flowers as well as the pond attracted lots of insects. They had a chicken wire fence around the pond and red dragonflies used to perch on the wooden sticks pounded into the ground to support the fence. Before I had a net, I would try to catch everything by cupping them inside of plastic containers my mom had given me. Trying to catch a dragonfly required lots of patience; if you've ever seen one up close you know they have huge eyes. I had to sneak up to them very slowly, then quickly try and capture them but usually they darted away. But, they would also return to their perch in a few minutes to give me another opportunity. And once in a while I was successful. This was a frequent occurrence with my other insect prey as well - I'd miss a butterfly or a bee or whatever, but soon enough another one would happen along and I'd catch it. One day I saw something I couldn't believe: a large, brilliant blue butterfly resting on a tree in the Tanino's backyard. 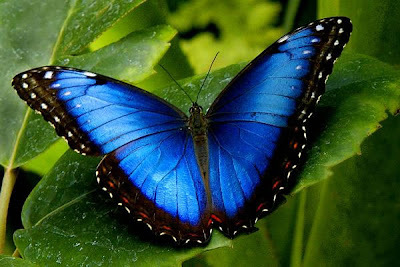 I'd seen this only in books because it was native to South America, a member of the Morpho genus. Now what it happened to be doing in that urban Los Angeles backyard that day is beyond me, although I had heard of instances in which butterflies hitched a ride into other countries hidden among produce and plants. Ah, my first exposure to an illegal alien, lol..
By this time my mom had sewn an insect net for me. This was something I absolutely had to have for my collection. It sat there fanning its wings as I crept up to it, then swung my net and flipped the cloth sack around the rim to imprison this beautiful butterfly. I knelt down to take it out of the net and.. it wasn't there. I couldn't believe it. I was sure I had it; I hadn't seen it fly away. I stood there looking all over the place for it but it was nowhere to be seen. Then I thought of the dragonflies and how they would return to their resting place; I hoped and hoped that would be the case with this butterfly. I waited for the longest time but it never returned. I played out the scene again and again, analyzing my actions, thinking if only I had done this or done that, but the end result was the end result. An empty net. I went back home and looked at the picture in my book to confirm what I saw and it was exactly the same butterfly. Eventually I stopped collecting insects although my interest in them has persisted over the years and for awhile I had Greg and Katie interested in them as well. When it came time to apply for college, the prospect of a career in entomology never took serious hold in my mind. In fact, nothing really took serious hold. And now, plenty of twists and turns later, I am where I am in my career and ask myself if I am happy. I know if I had applied myself more, going all the way back to high school and through the intervening years, I would have been more "successful," i.e., made more money, had more status or whatever, but I also ask myself if I would have been happier. I think about the missed opportunities, some like the dragonflies that came back several times but I never caught them or tried to catch them, and some like that Morpho that presented themselves once but were gone and never returned. The end result is the end result. One of my favorite television shows of all time is Taxi. It's about a group of New York cabbies who have aspirations to higher things in life but week after week, they remain cabbies. To those of you who are familiar with the show, I've always identified with Alex. I watch him and think, here's a guy who could be doing "greater" things than driving a cab, but.. he's driving a cab. Still, he's got a rich life. Though he has his ups and downs in the episodes, overall he's a happy guy with many blessings. Nevertheless, he still dreams of bigger and better things. The two aren't mutually exclusive. Then I think about the Harry Chapin song that bears the same title as the television series although the two are unrelated. I guess you could say this blog is sort of like my taxi. And sometimes I think I'm Reverend Jim..